My seasonal love affair with homemade caramel started not-so-innocently. The Christmas my twins were infants (read: I was seriously sleep deprived), Matt’s Aunt Julie sent us an awesome Christmas package in the mail. The package came during the day while Matt was at work and I was home with the babies (read: struggling to figure out how to take care of two babies). I opened the package and had no problem leaving the wrapped gifts wrapped, but there was a bag of homemade caramels that were NOT wrapped. At first my plan was to wait until Matt came home to eat a few caramels together. But then they were just sitting there, begging and pleading for me to try JUST ONE. To make a long story short, by the afternoon, one caramel became ALL the caramels. I felt terrible, so I did the only reasonable thing I could do: I asked his Aunt Julie for the recipe and made him some caramels. And I’ve made them every Christmas since. 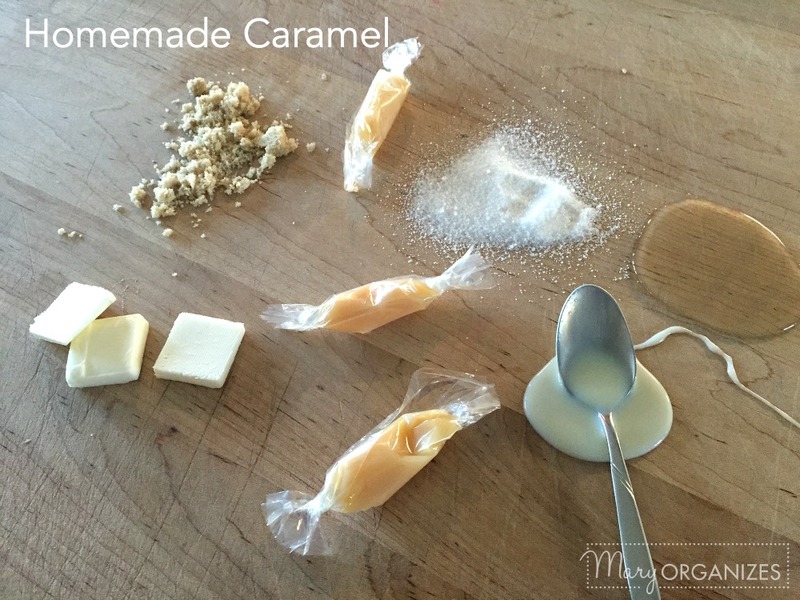 Warning: homemade caramels are addicting. Make them at your own risk. Cook in a heavy pan until the sugars dissolve into the butter. Add 1 can of sweetened condensed milk. Cook on medium heat until it passes the soft ball stage test (pour batter onto ice and try to roll into a ball). Pour into a greased 9x13 pan (glass pan). Let sit overnight. (optional) For Salted Caramel Version - sprinkle light amount of Kosher salt on the still warm caramel. Cut with a pizza roller and wrap in wax paper. 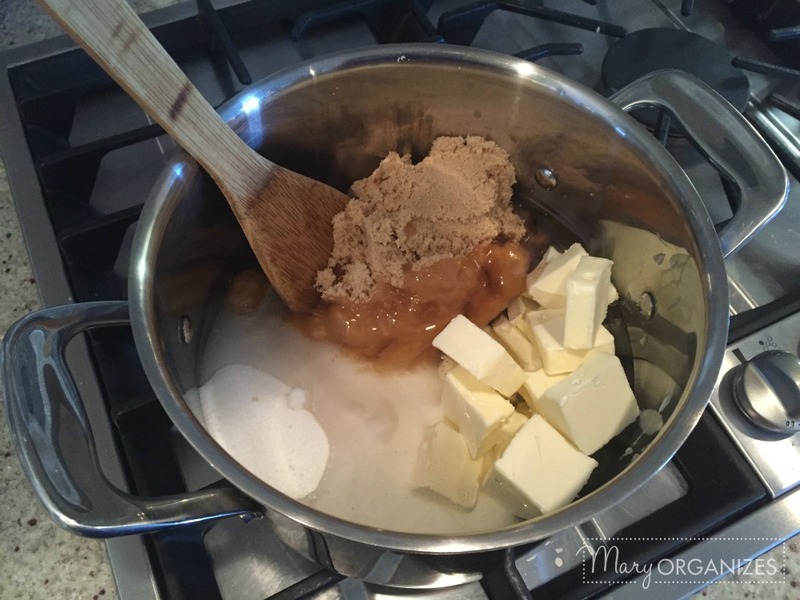 Put all the sugars and butters in the pot before you turn on the heat. This way you can always be stirring and you won’t burn anything to the bottom. Have a bowl of ice ready for the softball stage testing. All stovetop/pot combos are a bit different, but I timed it this year and it takes me 9 minutes of the mixture boiling on medium heat to reach the proper consistency. Here is the mixture after it has been boiling a few minutes. Don’t stop stirring! Buy wrappers pre-cut (try craft stores or Amazon), it really simplifies things. Of course cutting your own wax paper wrappers is what I did for 9 years and really isn’t the worst thing. After it has cooled and set, I spatula the entire blob of caramel out of the glass pan and onto wax paper over a cutting board. Then I use a pizza cutter to cut the individual pieces. This year was so different than that first year. My baby twins are now amazing 10 year olds with a super helpful 8 year old sister. 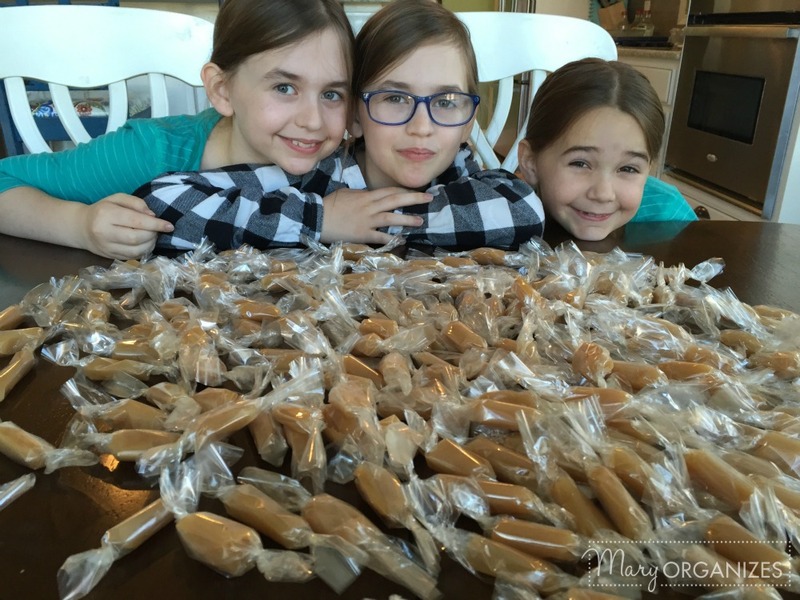 These girls are my wrapping assistants and make it so easy to wrap up a whole pan of caramel. They were wrapping them as fast as I was cutting them. Every 15 pieces they wrapped they got to eat a piece. Yes, very helpful and very motivated. This guy was an adorable sidekick, but not so helpful. 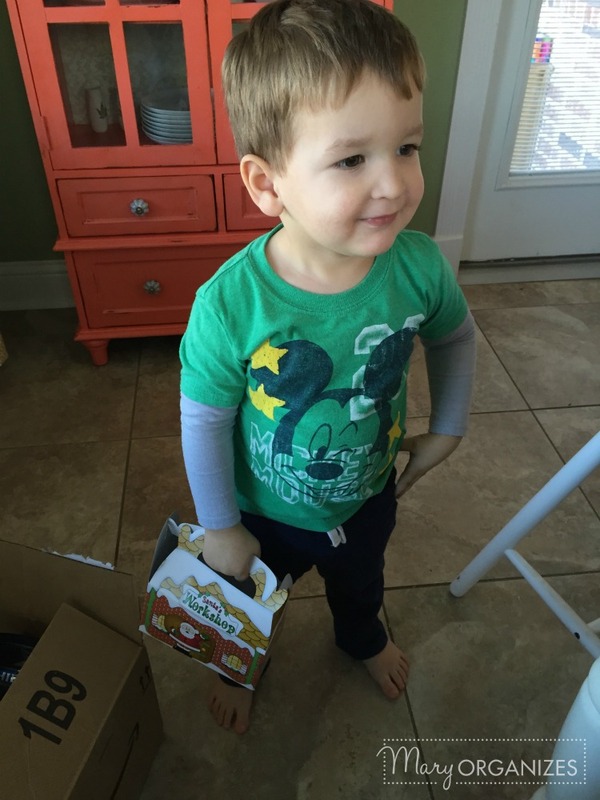 He played around us most of the time this year, but started to panic when he noticed the caramels were almost all wrapped, and then tried to grab as many unwrapped pieces as he could at the last minute. I can hardly blame him. 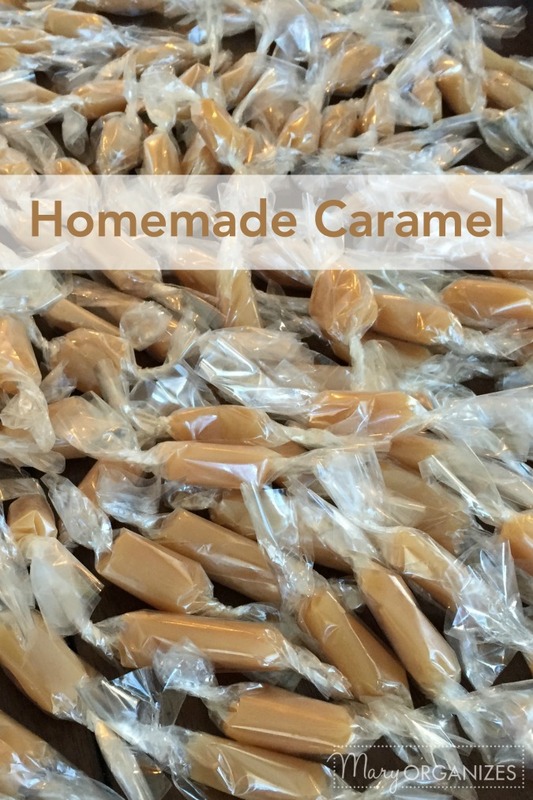 Homemade caramels have become a favorite tradition of ours. I hope you enjoy this recipe as much as we do! They all love you too, Mom, including those caramels! Are these soft caramels; hard (sucking) caramels; or soft-firm (read bites off smoothly) caramels? The way I describe making them is between a soft and soft-firm (not exactly sure the difference), but the stiffness is all dependent on how long you cook it. 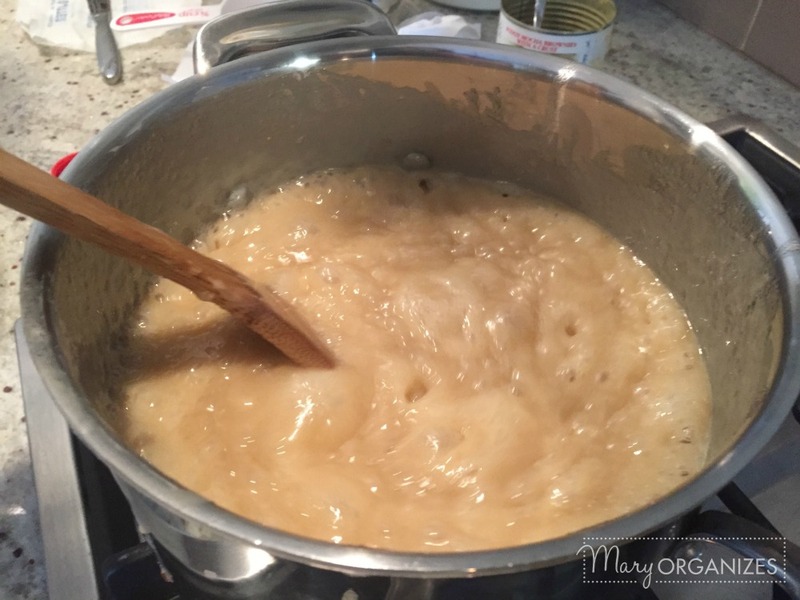 I’ve made caramel syrup with this recipe by stopping after all the ingredients are melted together for a minute. If you want super soft, you’d wait until they were at a really soft non-balling stage, as in it doesn’t quite form a ball when you cool some with ice and try to form a ball with some of it. I go until it forms a soft ball, which is to say that when cooled with ice, I can roll some of it into a ball easily. So, the hardness is totally up to the cook.